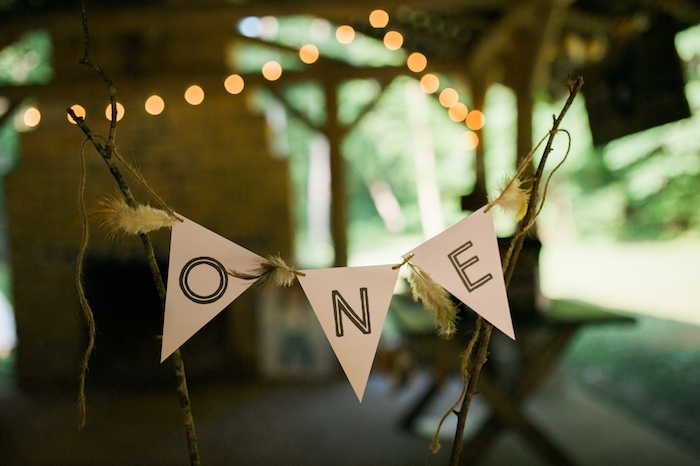 Looking for fun and fresh party ideas for your little one’s first birthday bash?! 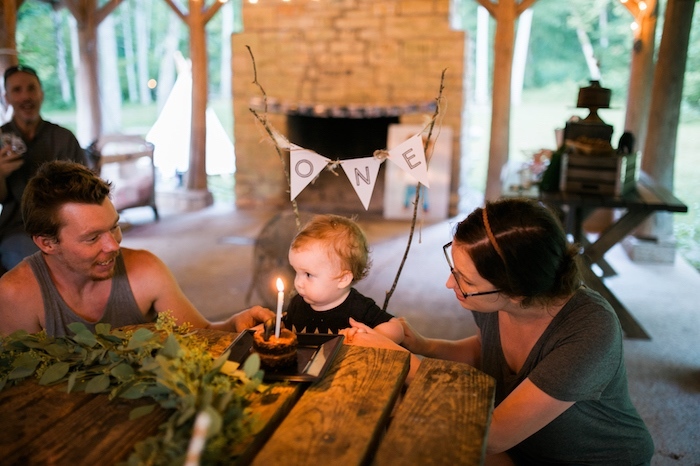 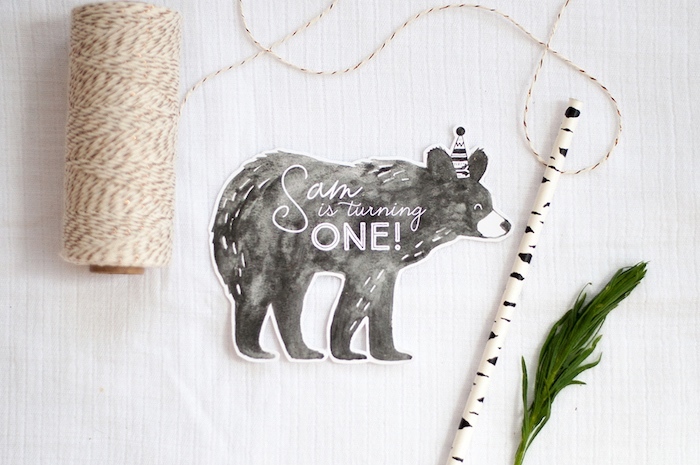 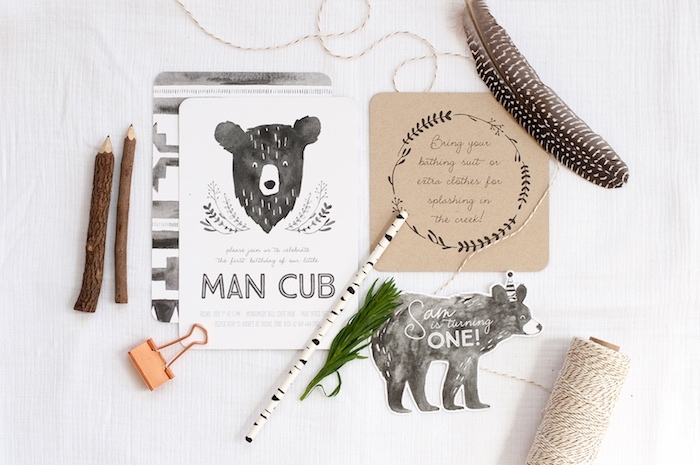 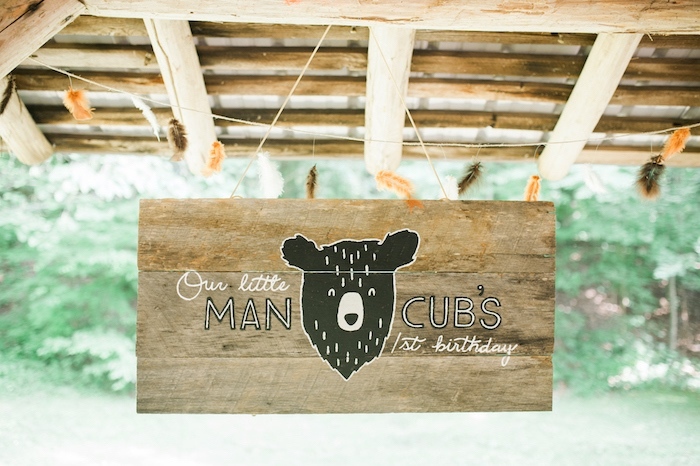 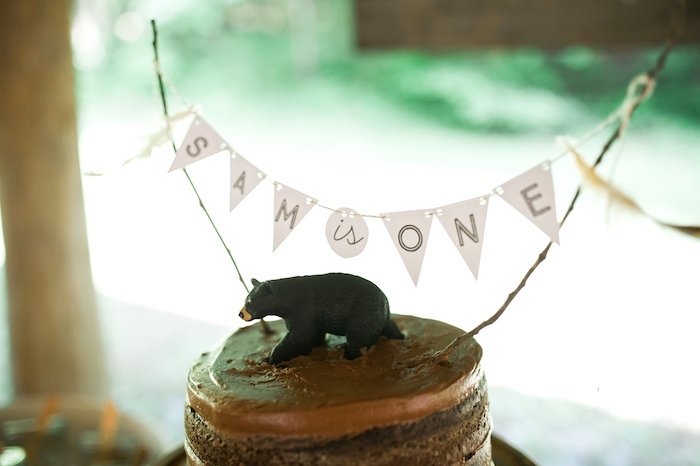 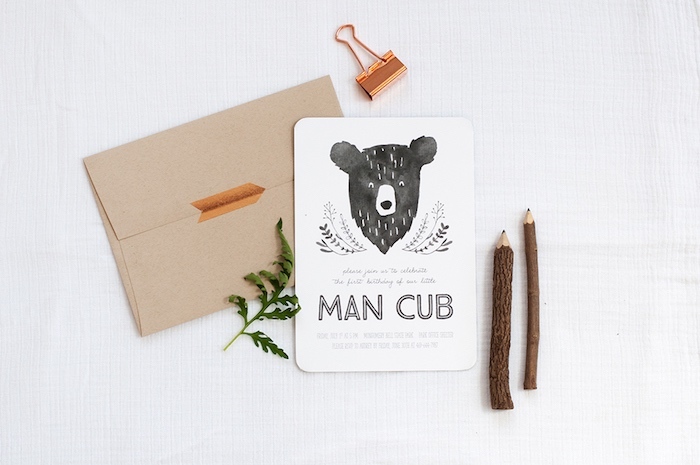 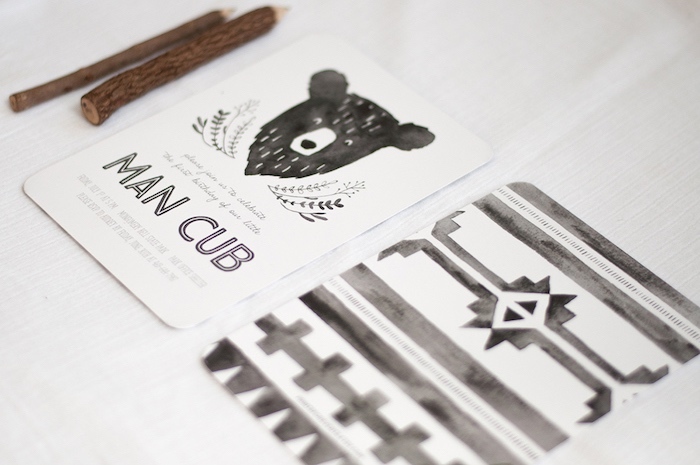 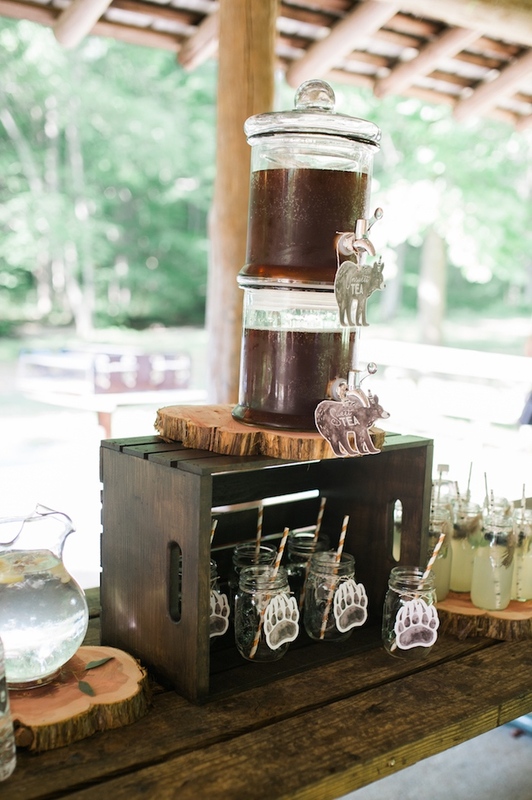 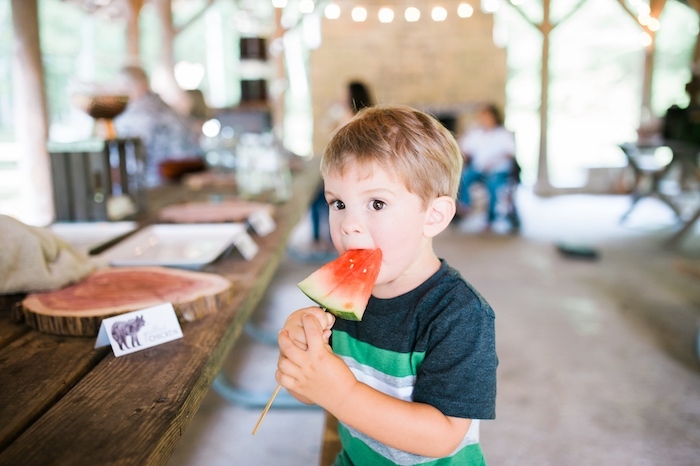 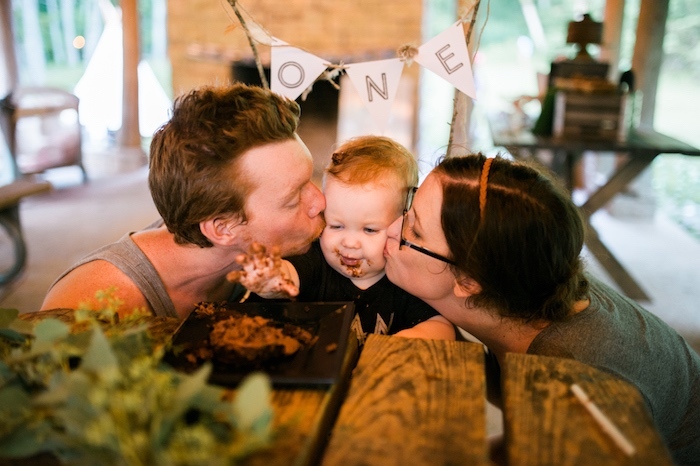 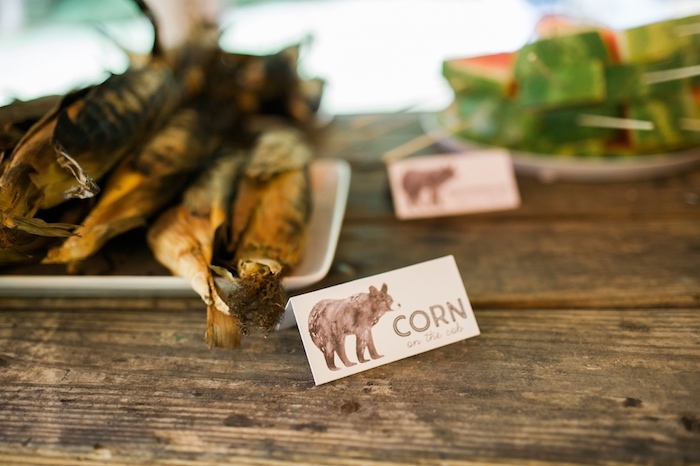 You will roar with delight over this darling Grizzly Bear Man Cub 1st Birthday Party submitted by Audrey Madill of Prints For Events out of Dickson, Tennessee! 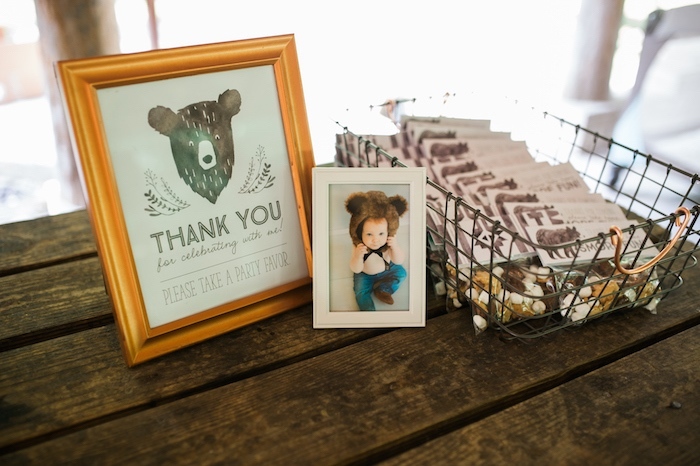 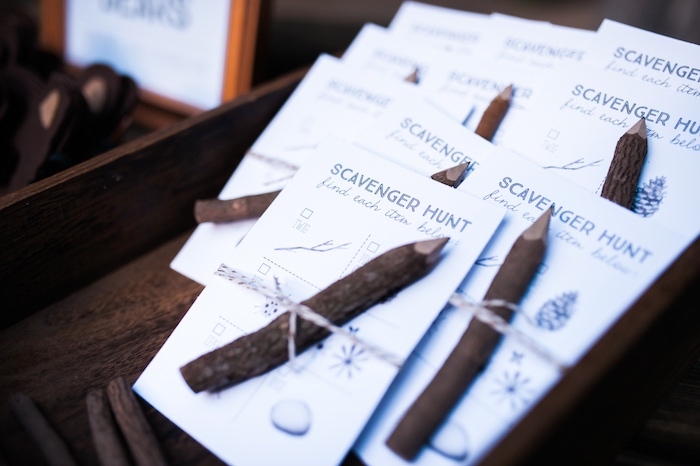 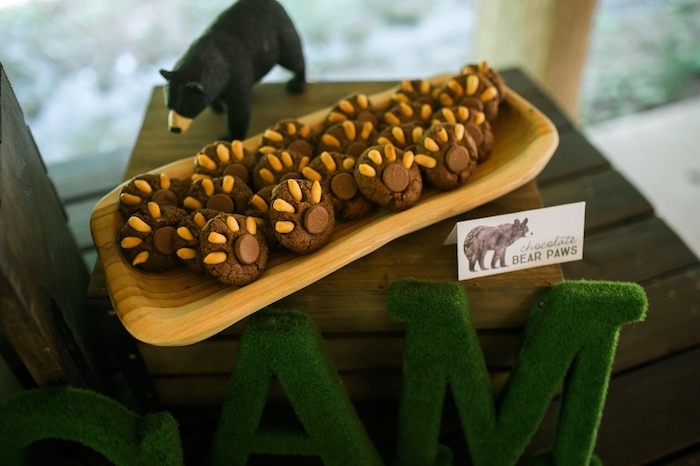 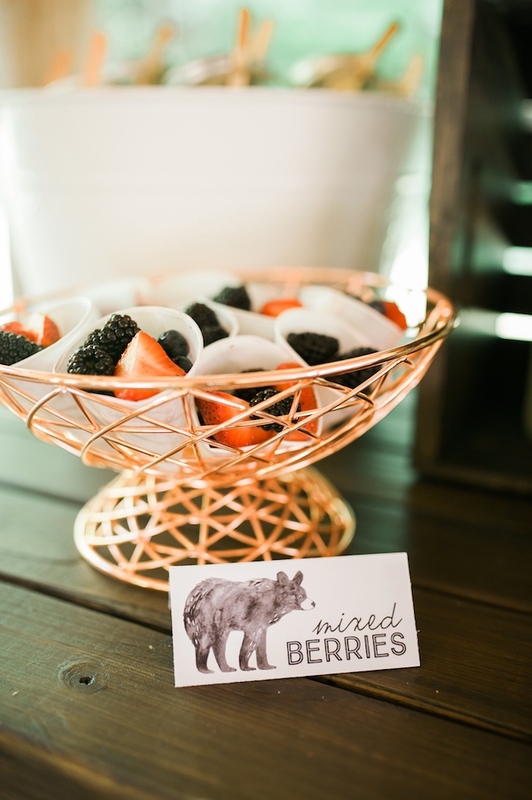 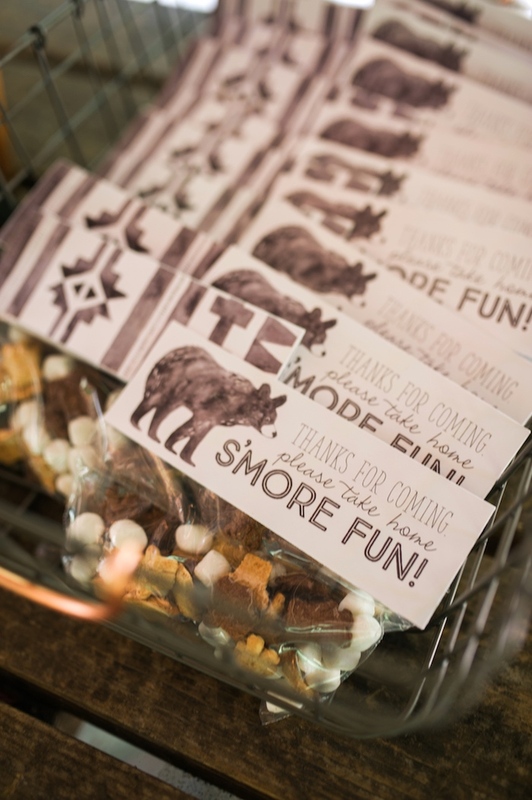 From the adorable Grizzly Bear invitation and party printables to the cute bear claw cookies, this occasion is packed with elements that you won’t be able to take your eyes off! 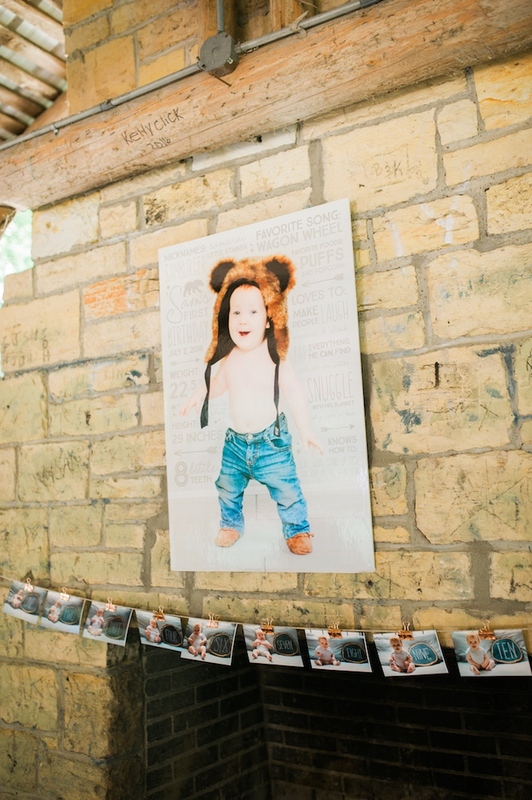 This is what Audrey shared about the party- “Our son, Sam was a huge baby and has always reminded me of a little bear cub. 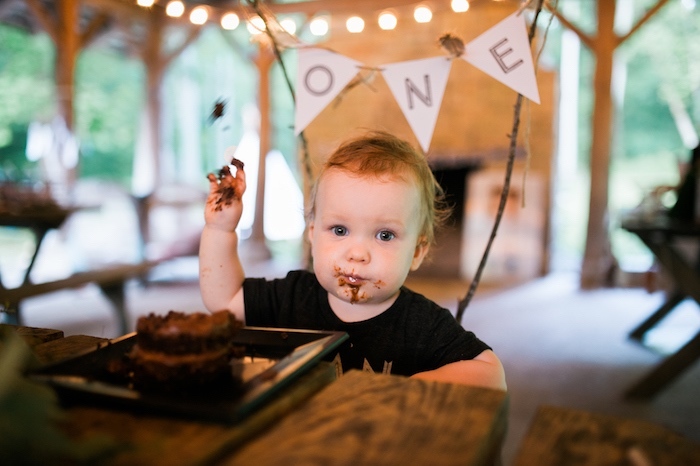 So when it came time to plan his first birthday, I knew that had to be the theme. 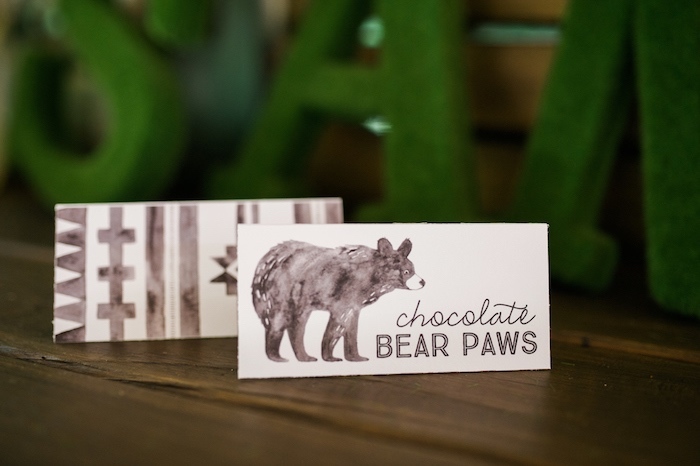 I started by creating some watercolor illustrations of bears and foliage, which were used in the invitations and printed goods. 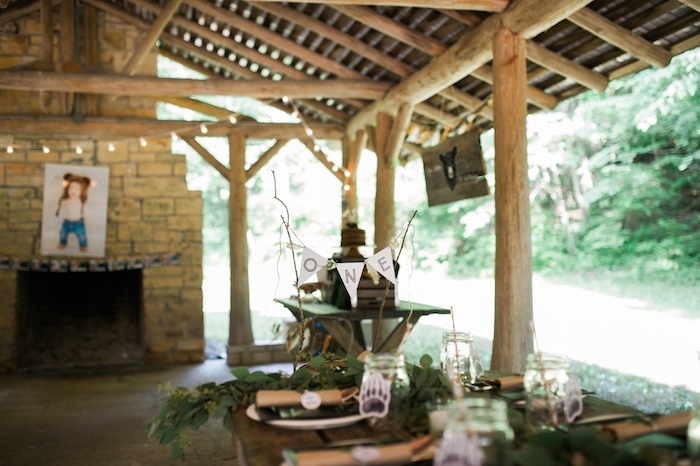 I stuck with a mostly black and white color scheme for the party, and worked in brown and green forestry elements like hand-sawn wood logs (thanks handy husband!) 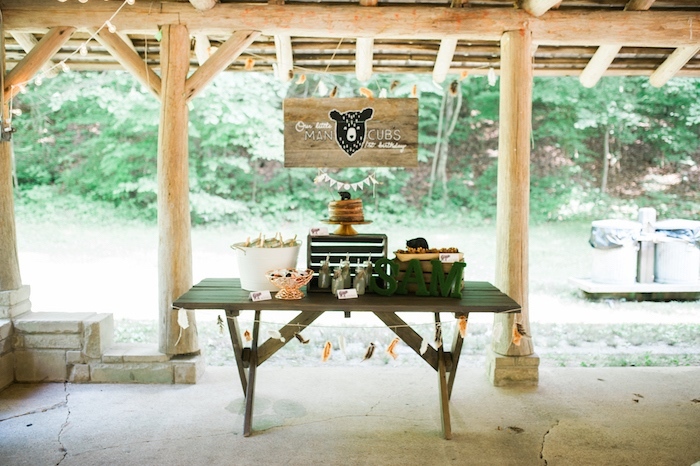 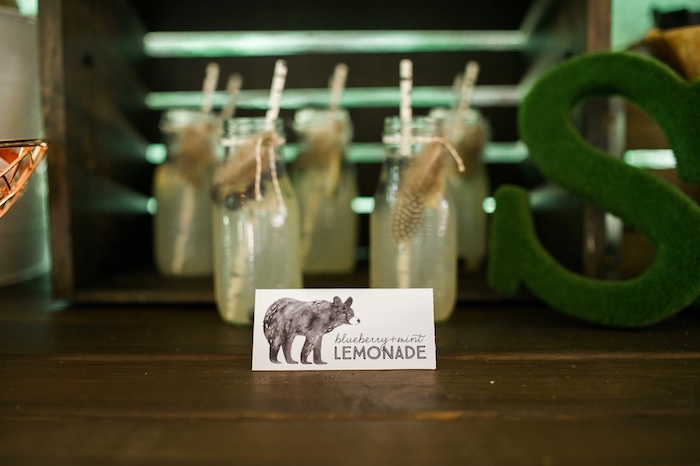 a big, reclaimed wood sign above the dessert table, wooden crates, and eucalyptus garlands on the banquet table. 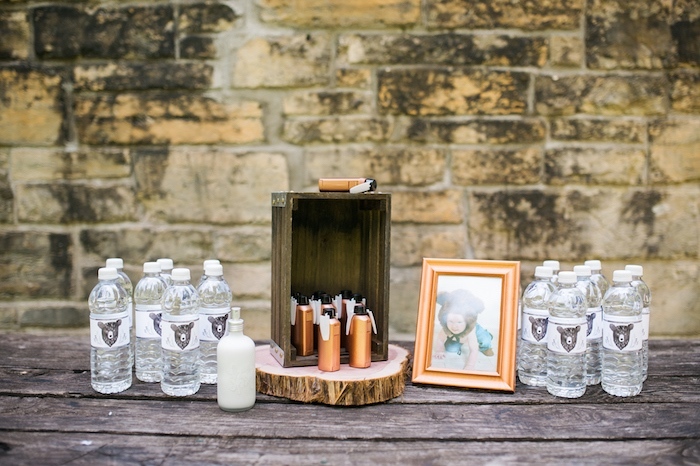 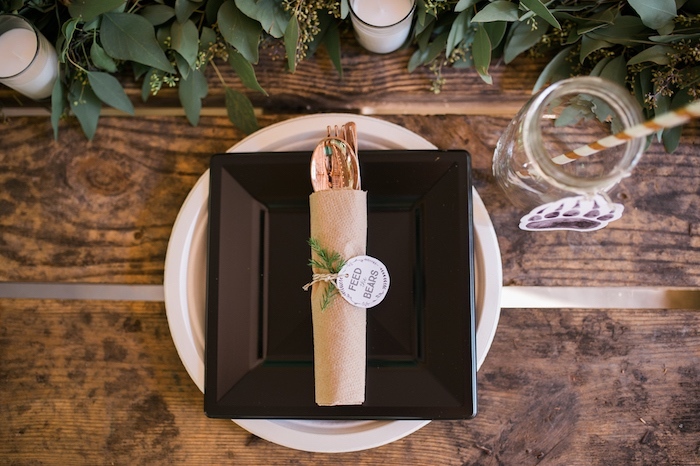 I accented with copper elements including bakers twine, flatware, and picture frames. 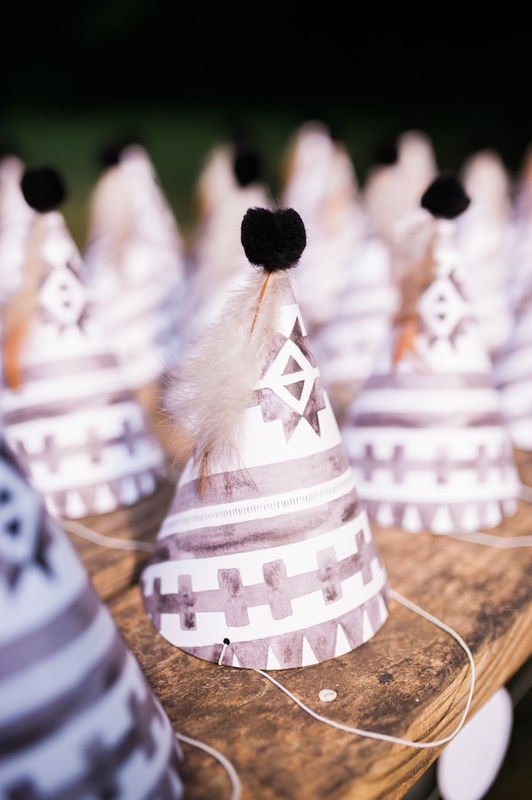 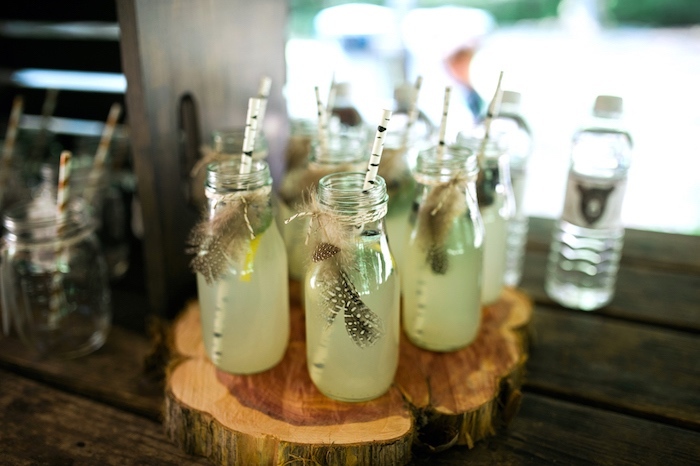 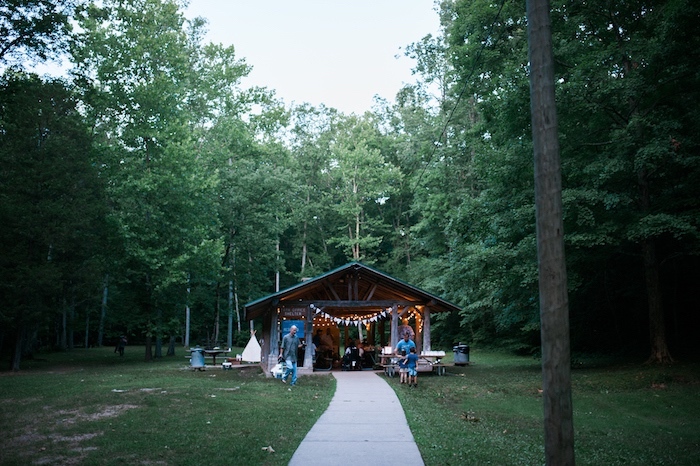 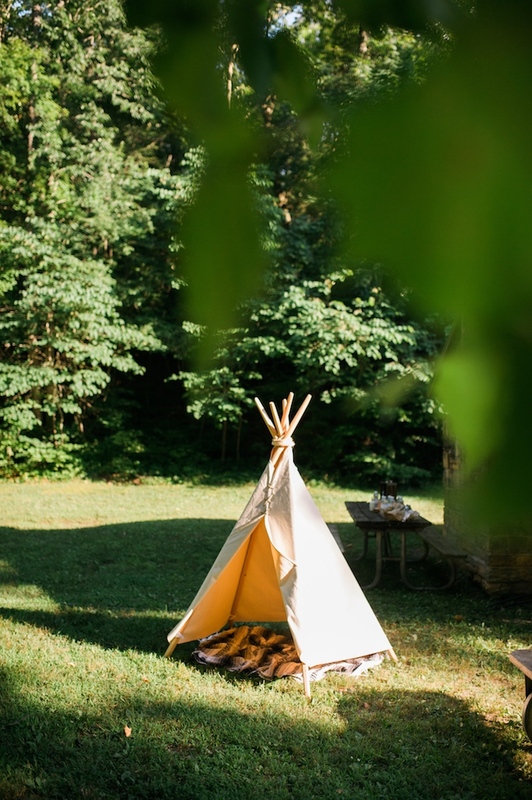 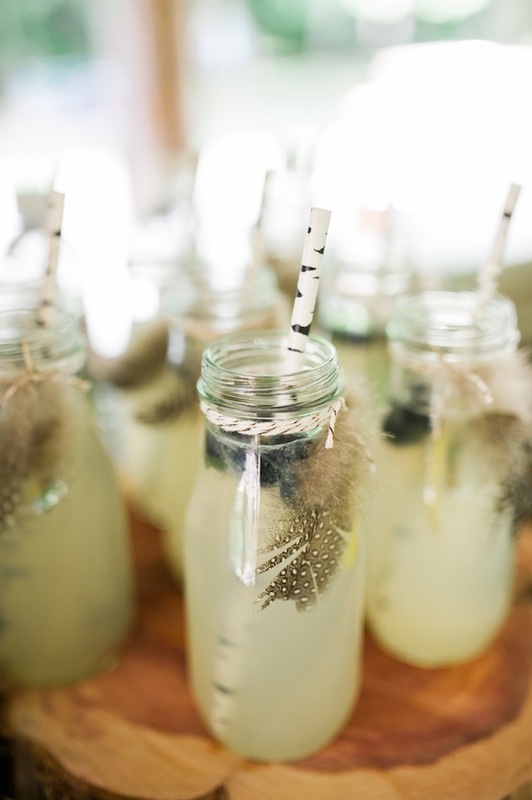 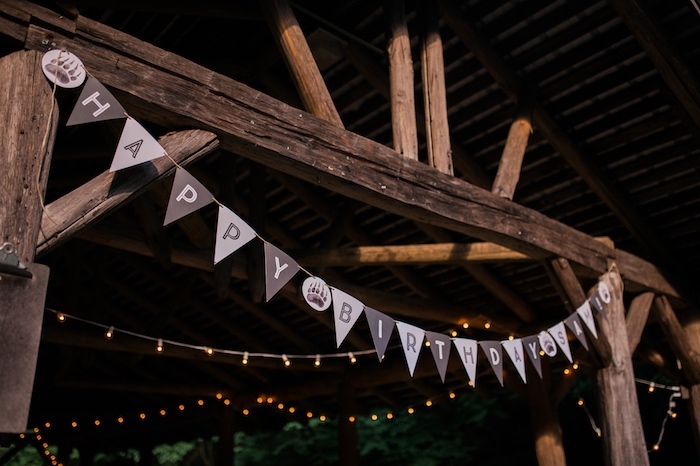 I also wanted to have a bit of a wild, little boy feel so I worked in some tribal elements like feather garlands, tribal-print birthday hats, and a teepee for the kids to play in. 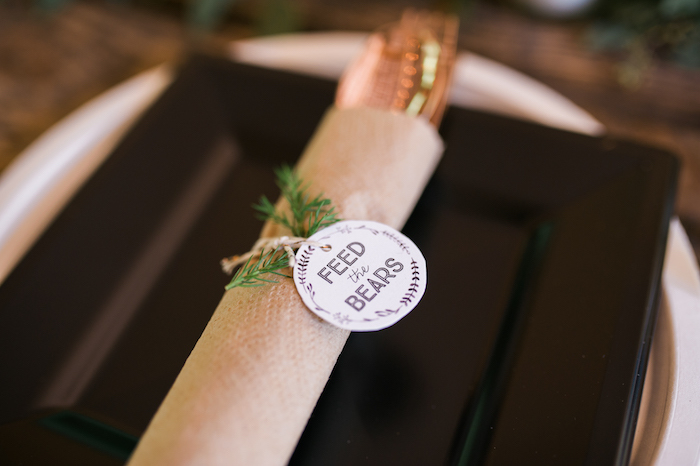 My favorite element of the party was the banquet table. 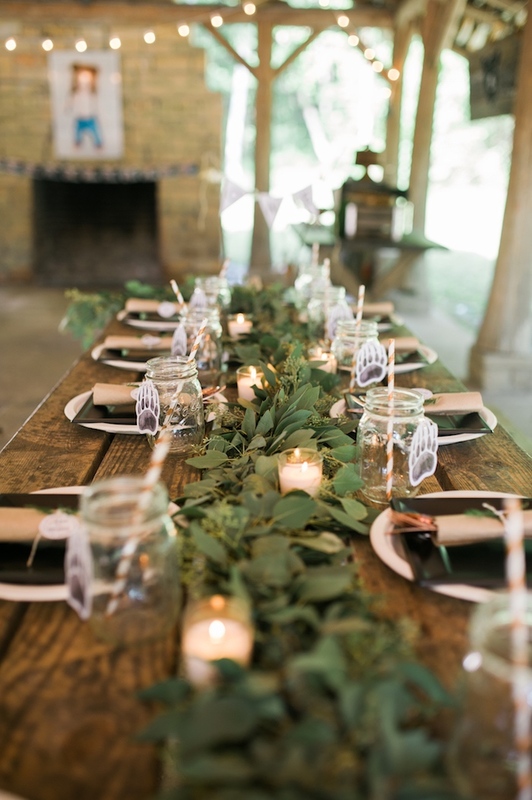 We had a big eucalyptus garland running down the center with little tea lights placed among the leaves. 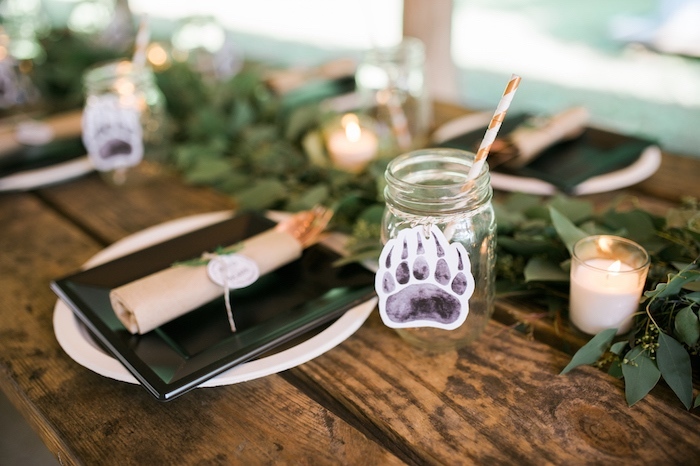 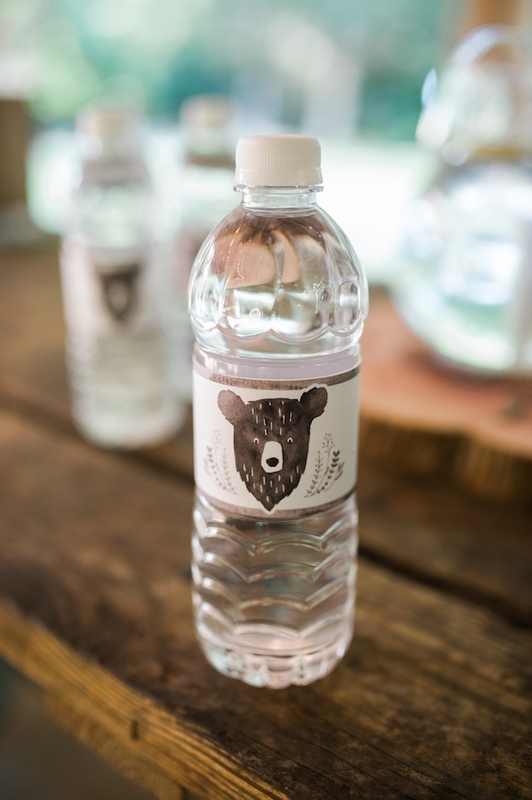 Each place setting had a cutlery pack with tags that read, “feed the bears.” For drink cups, we used mason jars with bear paw tags attached. 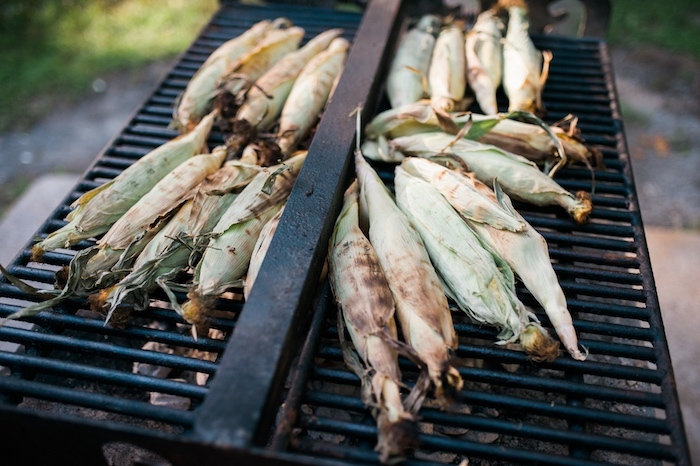 We served grilled chicken, corn, and potato salad for dinner. 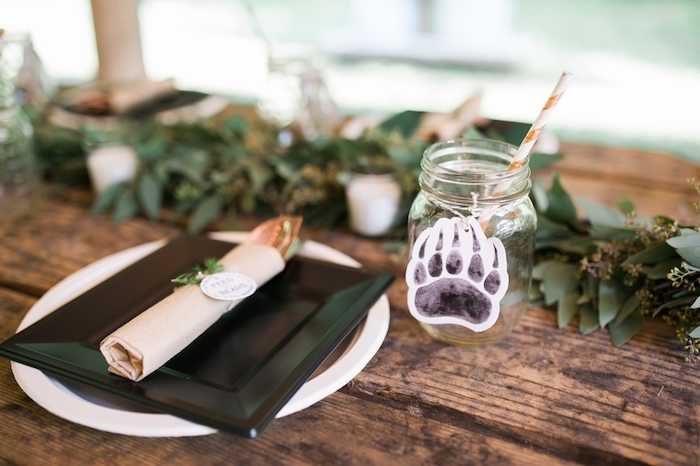 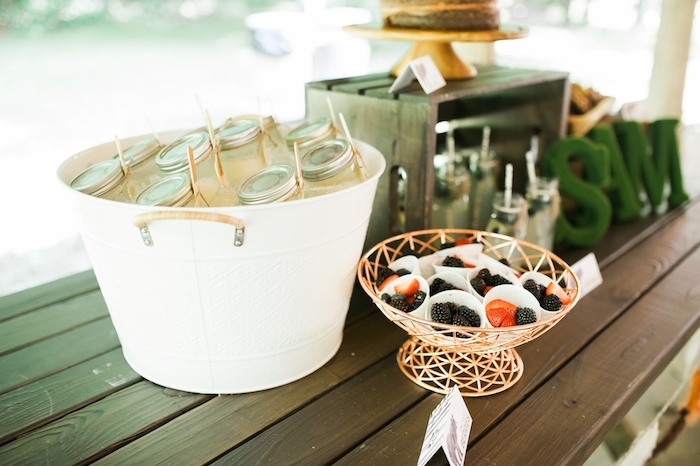 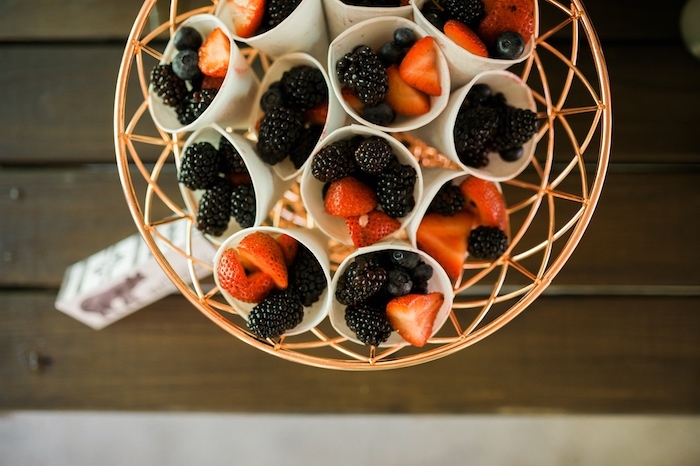 For dessert, guests chose from chocolate cake, bear paw cookies, ice cream jars, and fruit cones. 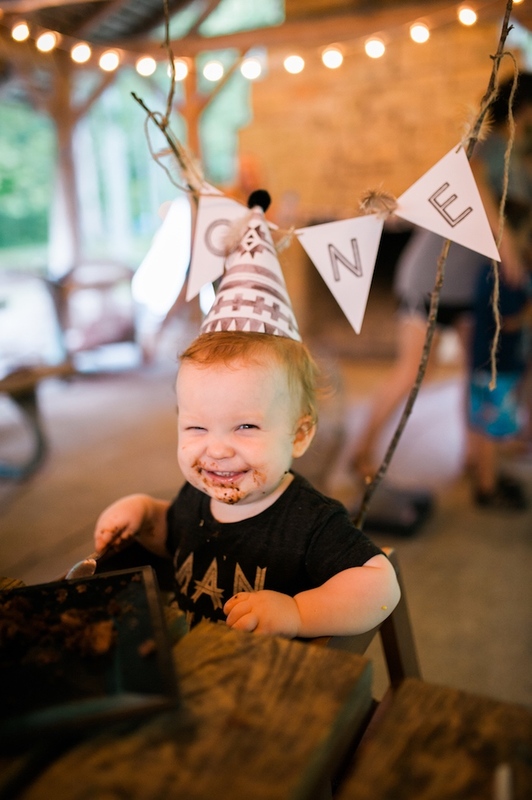 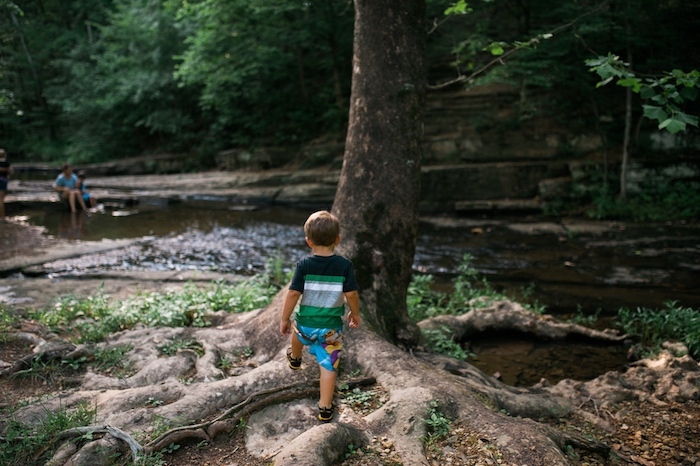 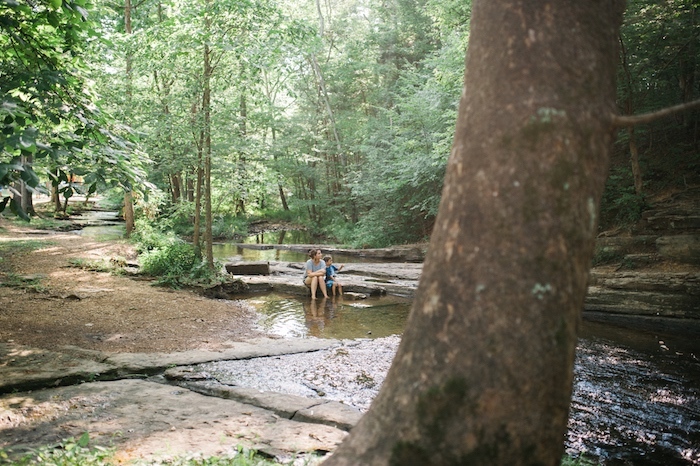 Activities included: splashing in the creek, playing in the teepee, a scavenger hunt, corn hole, and of course, cake and presents. 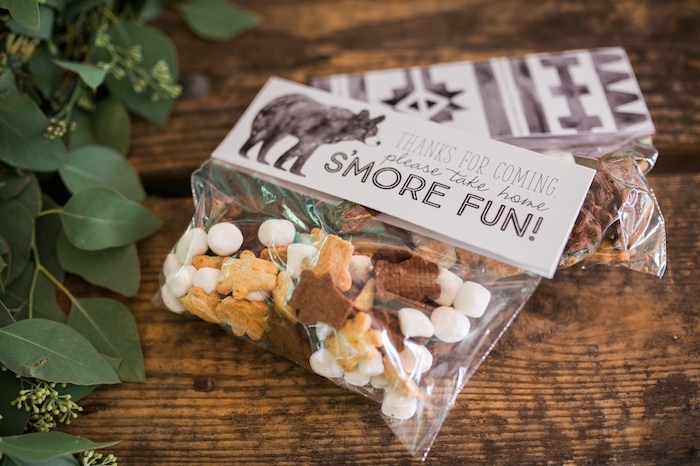 After the party guests were sent off with bags of s’mores trail mix and felt bear masks for the kids. 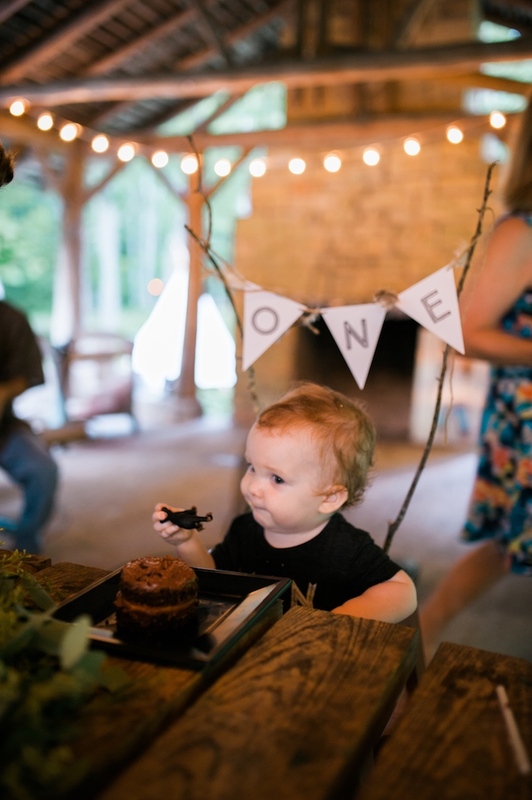 We had so much fun at this party and I hope you enjoy the photos! 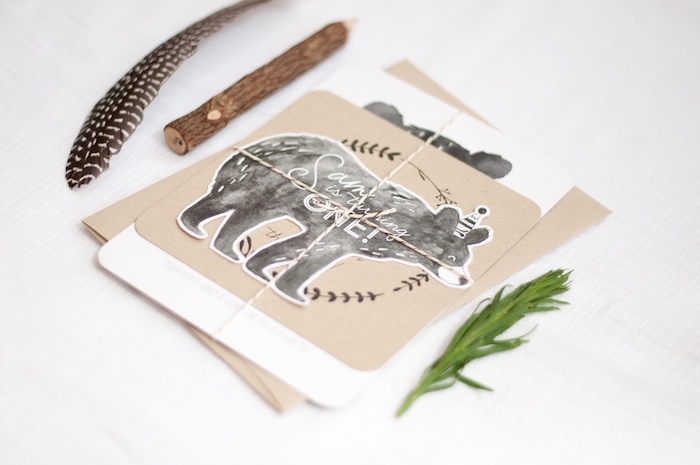 I also used as much as possible from the handmade community. 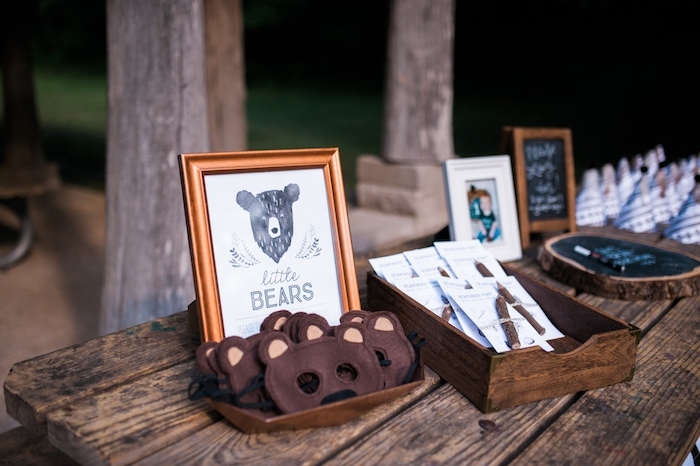 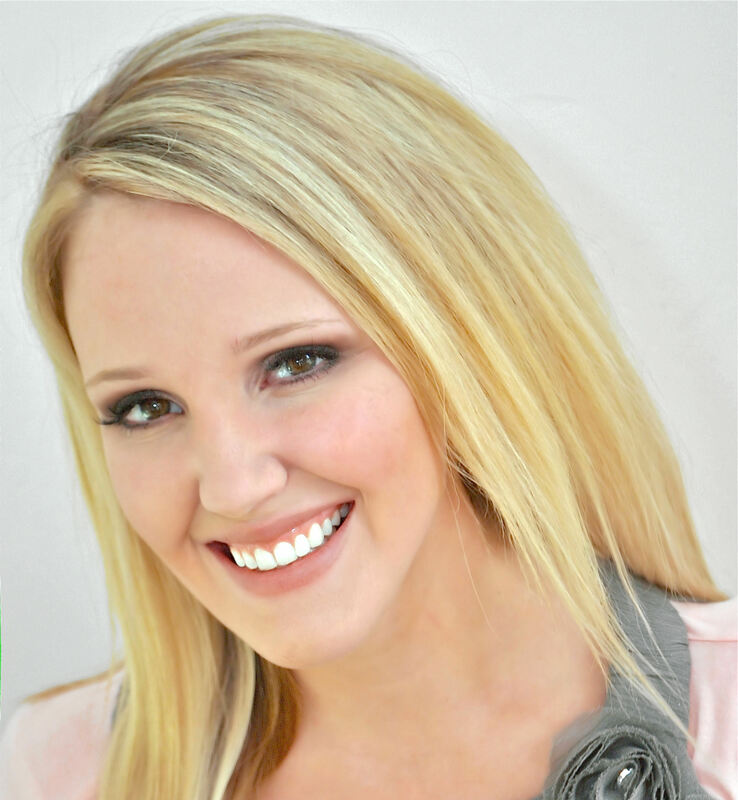 Check out the vendors for some amazing shops. 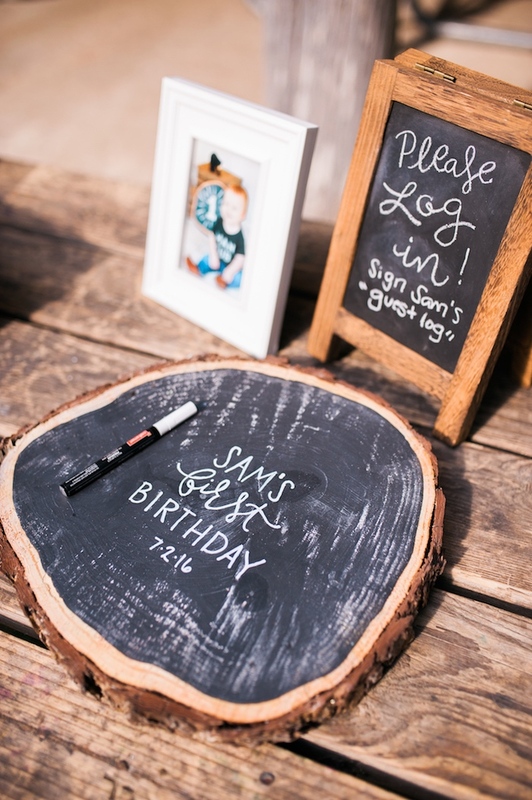 How did you make the wood sign? 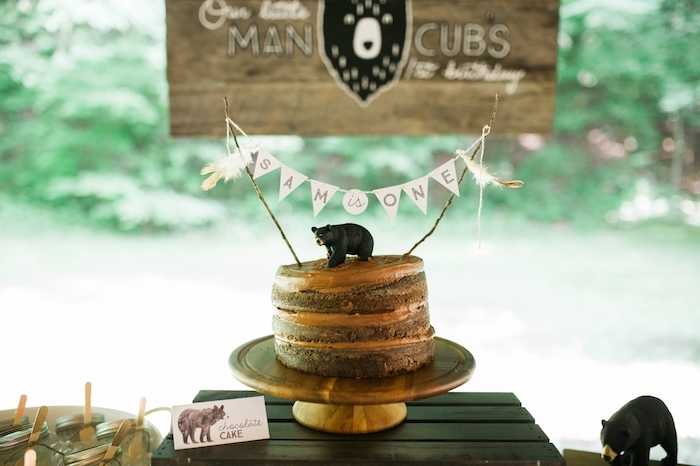 Is that vinyl?